There’s an article (in the New Yorker) about Andrew Hacker and James Tanton debating “eliminating mandatory high school math”. Combined with the recent Brexit vote, you get today’s comic. Originally there might have been more individuals with Maud, but I started the sketching after 9pm last night. VERSINE: New plan! 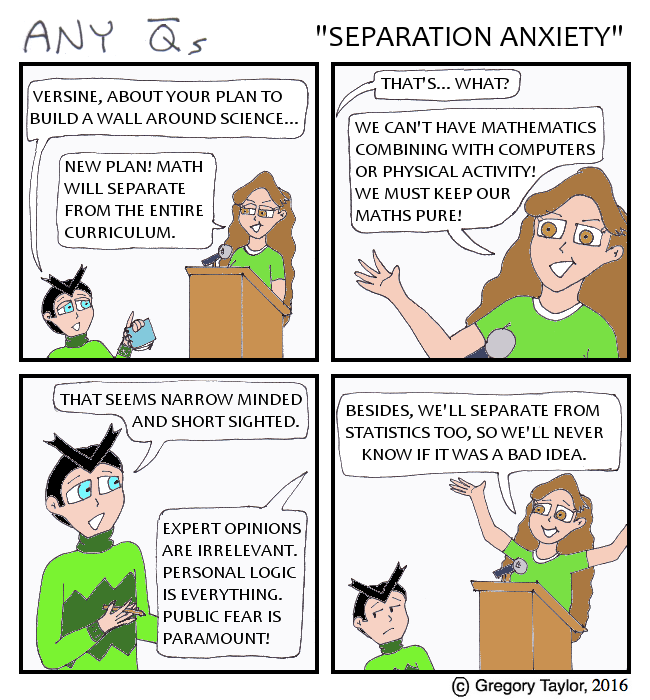 Math will separate from the entire curriculum. VERSINE: We can’t have mathematics combining with computers or physical activity! We must keep our maths pure! MAUD: That seems narrow minded and short sighted. VERSINE: Expert opinions are irrelevant. Personal logic is everything. Public fear is paramount! VERSINE: Besides, we’ll separate from statistics too, so we’ll never know if it was a bad idea.